Find out everything you need to know on the new Jaguar Xj from independent vehicle review website Car And Driving. You can watch the video review to the left to see more of the car or read their written review below to get a true insight from an expert in the automotive industry. Technological master classes though they invariably are, some luxury saloons do come across as being a bit soulless. If I was going to spend £60,000 on a car like this, which is about as likely as Bill Gates spending 50 pence on one, I'd want something with character and a sense of occasion that I could drink in every time I opened the door. There are models that deliver on this count, of course, but they tend to occupy an even loftier price band. If any car can deliver the goods for vaguely sensible money, I'd bet on Jaguar's XJ. I loved the previous generation XJ, but despite my strong traditionalist tendencies, I did recognise that it looked a bit old hat next to fiercely modern rivals. The latest car could never be accused of that. Breaking away from the big Jaguar mould, it has a fresh design that still manages to retain that classic Jaguar feel. That's actually the essence of what they've tried to do with this car: mix the old and the new in an elegantly seamless way. Older Jags with their wood and leather overload can seem stuffy by today's standards but the XJ updated the classic themes. The dark cabin on our test car sparkles with glints of chrome and there's a high-technology feel to the controls and the instruments which are actually digitally projected onto a screen in front of the driver. The classic natural materials are still in evidence, however, and overall I'd say the designers have done a fine job. This feels like the modern Jaguar. Many XJ owners will be reclining in the rear while an employee does the driving and it's a fine place to sit out a long journey. Vast legroom and plentiful headroom are laid on, while the fixtures and fittings have a real air of quality about them. Even the entry-level cars come generously equipped with twin sunroofs, leather trim, dual-zone climate control, electric front seat adjustment and a touch-screen control interface. The trademark Jaguar drive selector is also included on all models. This replaces a conventional gear stick and takes the form of a large rotary dial that rises out of the centre console when you turn the XJ on. At the top of the XJ range are normally aspirated and supercharged versions of the Jaguar 5.0-litre V8, with 380bhp and 464bhp respectively. 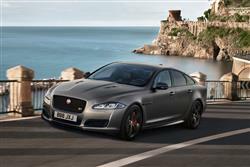 Plus Jaguar is also offering an XJ Supersport model with the supercharged engine upgraded to 503bhp. The diesel will inevitably be the most popular, however, and it's a 3.0-litre twin-turbo V6 with 271bhp. That's the model I tried. Even with this entry-level engine, there's a powerful surge of acceleration if you're bold with the throttle but what's most impressive is the refinement. The engine is barely audible at low speeds and there's only a slight grumble from the exhausts when you open it up fully. Wind and road noise are extremely well suppressed. The emphasis of the XJ is on comfort but it can hustle along and proves surprisingly nimble. The sharp steering is particularly helpful, making you forget you're piloting a five-metre luxury saloon. There are short and long wheelbase versions of the XJ available, while trim levels run from Luxury to Premium Luxury and Portfolio, with the Supersport model at the top of the range. The car is priced to match up against rivals like the BMW 7 Series, Mercedes S Class and Audi A8, so competition is fierce but the Jaguar appears to be well up to the task. This is my kind of luxury car, traditional in some regards but with advanced technology bubbling under the surface. Trying to split the XJ from its rivals on performance, styling and quality isn't easy because all the cars at this level are superbly engineered but for my money, this Jaguar has a big edge over the competition. It's an edge I'd call a 'sense of occasion' and if you try this car, you'll see what I mean.